Ann Arbor, MI (Sept. 6, 2007) -- How do you plan a magical Disney vacation when you have trouble walking around, food allergies, or are traveling with an infant or a senior? Do you know the best hotel to accommodate your unique needs? How can you request special assistance touring the parks or dining? 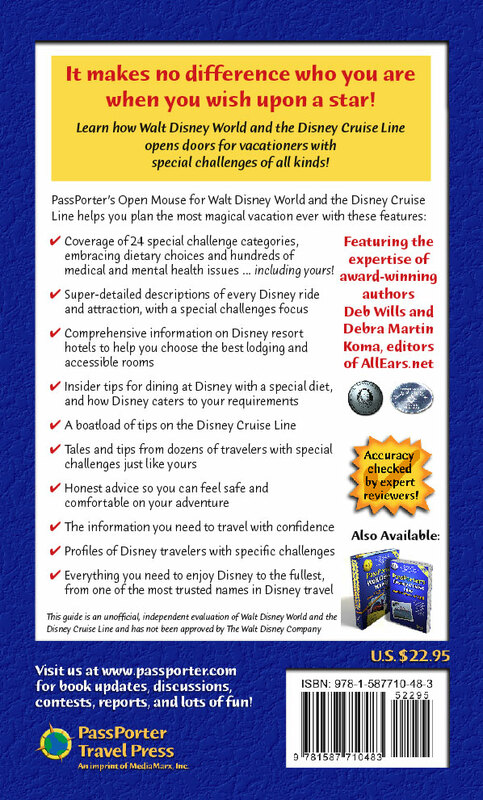 The answers to all these questions -- and thousands more -- are detailed in the new PassPorter's Open Mouse for Walt Disney World and the Disney Cruise Line guidebook (ISBN: 978-1-58771-048-3, 448 pages, trade paperback, $22.95) by AllEarsNet editors Deb Wills and Debra Martin Koma. PassPorter's Open Mouse for Walt Disney World and the Disney Cruise Line opens the door to Disney World for everyone! With more than 440 pages of in-depth information for vacationers of all abilities, this guidebook offers coverage of every ride, attraction and resort on Walt Disney World property from a distinctive "extra challenges" perspective. Edited by bestselling PassPorter author Jennifer Marx and peer reviewed by more than 30 vacationers with a variety of unique needs, this book is the second edition of the multiple award-winning PassPorter's Walt Disney World For Your Special Needs guidebook. 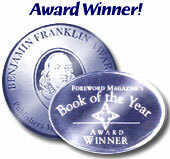 Authors Deb Wills and Debra Martin Koma received a Benjamin Franklin Award and a ForeWord Magazine Book of the Year award for their work on the first edition. 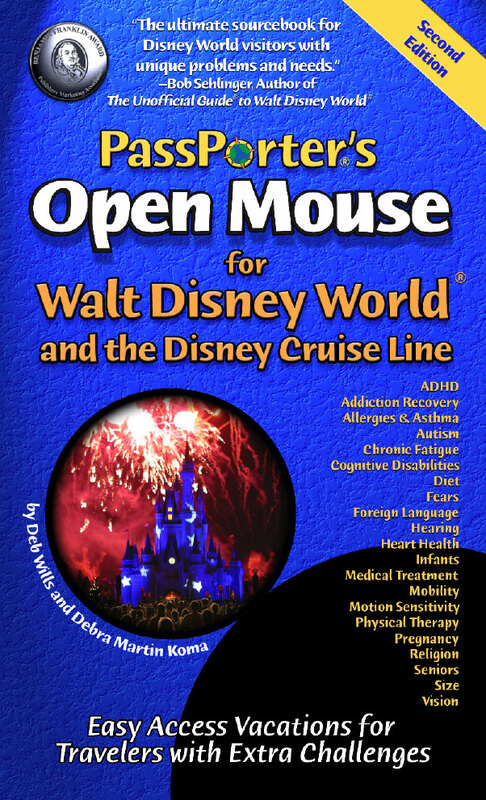 Bob Sehlinger, author of the bestselling Unofficial Guide to Walt Disney World, says PassPorter's Open Mouse is "the ultimate sourcebook for Disney World visitors with unique problems and needs. Well organized and crisply written, the comprehensive volume covers everything from the needs of nursing mothers to disabled access to autism. Almost anyone with a special need will find both understanding and excellent advice between the covers of this landmark work." Consider the typical multi-generational family planning a vacation--pregnant and nursing moms, parents with infants, cousins "keeping Kosher" or Halal, grandparents with declining mobility, a child with food allergies, an uncle struggling with obesity, a teenaged daughter recently "converted" to vegetarianism... everyday people coping with everyday needs. Walt Disney World does more to accommodate their many needs than nearly anyplace else, and PassPorter's Open Mouse tells you how. This completely updated edition offers coverage of 24 special challenge categories, embracing dietary choices and hundreds of medical and mental health issues. The authors provide comprehensive information on Disney resort hotels and thorough evaluations of every Disney ride and attraction with a focus on special challenges. In addition, dozens of travelers with unique needs, including special diets, provide numerous tales, coping strategies, and insider tips. Profiles of travelers with specific challenges give added insight to what makes Walt Disney World such an "open" vacation spot. PassPorter's Open Mouse offers everything you need to enjoy Disney to the fullest, from some of the most trusted names in Disney travel. To place orders for this guidebook, visit http://www.passporter.com, call toll-free 877-929-3273, or visit your favorite bookstore. Deb Wills: Bitten by the Disney bug at an early age, Deb Wills combined her computer skills with her love of the Walt Disney Theme Parks to create Deb's Unofficial Walt Disney World Information Guide (WDWIG) (http://allearsnet.com). Over the past eleven years, she has developed the site into one of the most up-to-date, independent resources about Walt Disney World on the Internet. Deb also publishes ALL EARS(R), a free weekly electronic newsletter with over 89,000 subscribers from around the world. She is widely recognized as a Walt Disney World expert, and was featured in the Chicago Sun Times article, "Queens of the Internet." Deb also helps raise funds and awareness in the fight against Breast Cancer, and is herself a breast cancer survivor. Debra Martin Koma: A freelance writer since 1989, Debra Martin Koma has written about food, travel and lifestyle issues for a number of local and national publications, including airline in-flight magazines. She has visited Walt Disney World more than 40 times in the past 13 years, and enthusiastically shares her passion for the Orlando resort with readers of AllEarsNet and its weekly companion newsletter ALL EARS through feature articles the cover a variety of topics. About AllEarsNet: According to a recent Disney-released consumer survey, 90% of vacationers planning a Disney vacation turn to the Internet. AllEarsNet consistently tops the lists of favorite Disney World information resources. The Wall Street Journal, The Unofficial Guide to Walt Disney World, and even MSNBC.com have all singled-out AllEarsNet as a top pick for vacation planners, and countless individuals on Internet discussion forums recommend visits to "Deb's site" for all kinds of Disney vacation information. Visit AllEarsNet at http://www.allears.net. About PassPorter Travel Press: PassPorter guidebooks are known for their comprehensive information, devotion to accuracy, and unique planning features. The publisher's flagship title, PassPorter's Walt Disney World (tenth edition out in November 2007), features PassPorter's unique PassPocket organizer pockets. PassPorter's Disney Cruise Line will be out in its sixth edition in December 2007, and is the most comprehensive guidebook devoted to the Disney cruise. There are more than a quarter of a million copies of PassPorter books in print. Visit PassPorter.com at http://www.passporter.com.